Thank you for the detailed and easy to follow instruction. I have a question about creating my own data set. does the text have to be in one line? does it matter when I hit enter/start new line? @Jeff Yes, I meant the input text! Thank you. I was thinking of testing it on song lyrics and they’re usually formatted one sentence per line. So just to be sure, I can just copy/paste the text from this page (and other ones like it) and it will mimic it? That’s right! 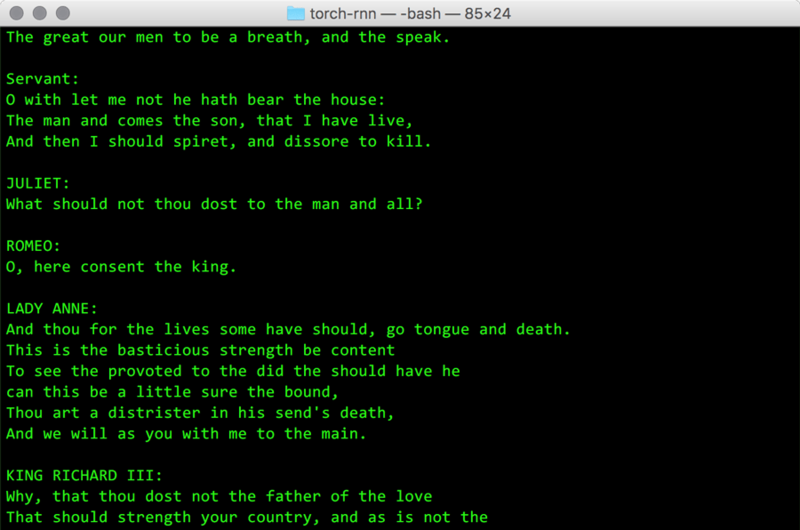 Try it on the built-in Shakespeare file (as shown in the tutorial) and you’ll get something that looks like a play. I already had anaconda installed. Do you think this might be it? No idea, sorry – maybe something here will help? I tested the opencl install and it passed all tests. I’m guessing the new method saves files in different place than what torch-rnn is looking for? a) if I set it to 512, the model just copies the original input and the output is basically a rearranged version. b) if I reduce it to 256, half of the document seems to be generated and the other half is copied. Why do you think this happens? is it because my input is too small for the size of a network? Hi There, I’m having some issues here in macOs Sierra, I’m not sure if it’s a OS version problem, but I tested it in two machines and followed all the help tips around there. Nothing worked for now. The error shows something like a syntax error but I couldn’t find where is it and makes no sense since I’m using the files that you’ve uploaded. Can you post the error itself? It’s hard to judge from what you’ve shown here. Also, can you try just running the th command to see if you get the Torch prompt? If it doesn’t work, you probably installed Torch incorrectly. Hi Jeff, what do you mean with the “error itself” ? What I’ve posted is the error that I have. Torch is working well, I tested and everything is fine. Also hdf5 in python is imported as well. This is where I’m confused because I don’t know where the error is coming from. I will check in others forums to see if Sierra is causing the problem anyway. It was a Sierra caused error. Now I have new errors… but, step by step. I needed two extra hacks on Mac OS Sierra. local process = io.popen(“gcc -D ‘_Nullable=’ -E ” .. headerPath) — TODO pass -I. First off- thank you so much for creating this and sharing it with the world. Any idea what is going on? I’ve tried other txt files and the program has worked wonderfully, so I’m not sure how to diagnose what is going on with this txt file in particular. @Britton – this is probably because there are weird unicode characters in your input text file. Doing a find-and-replace for them will be tricky, but you could try one of these solutions in the Terminal. Alternatively, you can add this to the scripts/preprocess.py file after line 29, though it will skip any non-ASCII character, so you’ll want to disable it for emoji support, etc. Hi Jeff! Thanks so much for your quick response. Took me a bit to implement in into the Python code correctly, but your code fix actually caused my errors to give up a few of the specific unicode characters that were causing problems, which I could go in and replace. The only thing I had to change was the exception to be UnicodeEncodeError, instead of UnicodeDecodeError. I tried adding the same bit of code before that splits line (after it says “for char in line:”) and it seems to have gotten through preprocessing alright! Haven’t trained yet, but thought I’d give you a heads up. Thanks! Hey jeff, i’m mostly new to using the terminal, could you please look into my problem? Thanks, that helped me out :), I applaud your knowledge of these things, so psyched to get started. @Rien – did you look through the possible fixes in the tutorial and the comments? There are quite a few things you can try to get the HDF5 library working. I’ve had a lot of fun playing around with your tool, and I’ve tried it on a few different styles of writing. I’m curious- if I want to train the system on a different txt file, do I need to “reset” anything else to start with a clean slate? Or is new training only using the data/txt file? The reason I ask is that the output from one experiment looks weirdly unlike the txt I trained on, but very similar to a previous txt file I trained it with. It’s certainly possible that I’ve made a coding error, though. @Britton – you can run again without any resetting, but it will overwrite any old training files, so you’ll want to move them before running on another text. You’re probably getting similar output because the new training file ended before the old one, and you’re just calling the old training t7 file. Try moving them and re-training. also I was bit confused to see val_loss keep growing up wile the loss do the opposite (as expected).. As my training sample is quite small maybe it mean I’m overfitting? If one knows how to avoid thad it would be great. but overcame it as per the instructions. I can find an older homebrew (version 1.8) but looking at the python library hdf5py I think this depends on 1.8.4 or above. Eek. I’m also not sure how to make home-brew recognise the older version as it’s default. Any thoughts? Has anyone else had the same problem? Thanks again for your help putting this together. I’m sure there’s a better way of teaching brew which version to default to without dragging folders around but at least it works! @Jeff Thompson, you rock. I have implemented Adam Loving’s hack. FYI multiple subtle bugs are introduced by pasting the string directly; not just are the quotes converted to unicode “smart” quotes, but the double hyphen prior to “TODO -pass -I” is converted to an em-dash as well (at least, I’m assuming that was a double hyphen?) . Not sure what to do with that… I’d be grateful for suggestions. I’m a little ambivalent whether to proceed with the 8.0 driver or revert to 7.5, as the 7.5 driver page doesn’t include 10.12 among the supported OSX versions. I had all these problems, redirected things using config.lua to an old version of hdf5 1.8.17 already in the anaconda installation, but then couldn’t get past the problem with _Nullable. Gave up. Going back to the Cristal/torch-rnn version for CPU only running in docker it worked perfectly first time all the way through. Training took about an hour. Sample worked too. Now stuck on how to use different text with script/preprocessor.py in docker container. @Kevin – running a Lua script via the training shouldn’t do any ASCII conversion, not sure why you’re getting that error. For your string/nil problem, I really can’t help you, sounds like either a) you broke something :) or b) you’ll need to post that to the Torch-rnn repo as an issue. Re driver support, I’ll add a note in the tutorial but can’t offer any (useful) advice on whether to keep 7.5 or upgrade. @pudepiedj – I’ve not used Docker, but you should just be able to pass a different text file as an argument for training, no? Hey Jeff, based on the helpful comments around here and your tutorial, I made an in-depth guide to try to help other users take care of the errors they keep getting when it comes to the HDF5 library. The common issue I’ve seen is users having conflicts with the “th” commands posted near the end of your tutorial. …Then there is a problem with your HDF5 installation configuration. As another user pointed out, you’ll need Terminal to use an older version of HDF5 to get this tool working right. I have included some additional steps to the process to ensure that you can properly make use of Touch-rnn w/o problems. Any ideas how I can fix this? Thank you. @Grishma – not totally sure, but I’m guessing there’s a non-ASCII symbol in your training set? You can clean your training files of non-ASCII characters, or modify the scripts as described here. @Erik – yikes, not sure. It’s clearly that the h5py library didn’t get installed. I think you’ll have to try again using pip as suggested, or post it as an issue on the h5py repo. I did eventually get everything working though. Hooray! Thanks again for this. hi there, when it comes to step three and the SSH key error. if i decide to download manually, where should i put the file to get things right? @Crafted – that’s a Github issue that first-time users get, which can be fixed with this step.